Honestly I feel like Taker lost simply because he can't go anymore. I found the match incredibly boring until the end where the entire crowd was flabbergasted/butthurt. I'll always love The Undertaker but it's time for him to go away. Only thing I didn't like was Bray losing. I feel like his whole schtick is pointless unless he goes over every time. 4.75 star pay per veiw full of twist, great story telling, great spots, and nice wrestling. I didn't think the streak should end but honestly it was getting so boring. How many times was a feud going to revolve around two guys staring at a giant WM sign. It was the same uninspired story year in and year out. The streak storyline wore out about 3-4 years ago. The only thing it had going for it was the matches were usually good. This match was not good, didn't think it was going to be either. Taker was too old to work a decent match with Lesnar. Wow, I was sure they'd screw it up and break everyone's heart with a Batista win, but they finally got it right. 'bout time, WWE. I don't think it'll hurt him much, he's already slinging with the big boys and his opponent just happens to be Cena@Wrestlemania so its not like he's going to win. Yeah, his feud with Shawn Michaels is the peak of the Streak storyline. Taker and WWE will never ever top that. You seem to enjoy watching people get trolled. You and I have something in common. After Brock won, I texted two people I know, one a Taker fan, the other hates Brock Lesnar, telling them about the loss and asking "U MAD BRO??!?". Sadly, neither of them responded. As for the PPV itself, I thought it was pretty good. Pleasantly surprised Daniel Bryan won. Bray may have lost the match, but he won the mind game against Cena, and while it's not the most clever ending, I'm not disappointed. Overall, hella good 'Mania. Bray's entrance was the best of the night. The only thing I didn't like from the bray match is that it was the Kane rise above hate script word for word. The only reason. It was better this time around was Bray doing a much better job of story telling. I have to agree this was a really good pay per view (except for the shield tag team match. The pre-show was much better). WWE managed to shock everyone with the disappointing ending of the streak, and I think it was a poor way to end something that in many people's eyes should have been used to legitimize a young talent or just be the one "sure thing" in the company. Letting Brock win feels cheap and just depressing. Kinda like Sheiky winning the Gimmick Battle Royale at X-Seven because he literally couldn't go over the ropes. While I love the insanity of The Iron Sheik, him winning because he was the right place at the right time is just sad. Welcome to wrestling, folks. The main event was better than it deserved to be but I was hoping for an Authority screwjob and keep the storyline going while watching New Orleans burn to the ground with all the "riots" that people swore to have. Now that Bryan has the belt, hopefully they will let him have a real run rather than dropping it at the next PPV or on superstars or something. Supporter of the WWWYKI initiative. As the biggest Taker hater in the world, about time I literally ordered my first ever Lesnar shirt as tribute. Lesnar is the biggest heel in the world right now. And that's exactly what would happen to whatever up and comer they decided to end the streak. Why would they put something like that on Reigns, Cesaro, or Wyatt's shoulders? They would just be the douche who ended the streak. I think they thought that most had regarding beating the Undertaker at Wrestlemania is that all those wins in that streak show that beating him is an epic challenge. Many of the best couldn't do it, some of them despite several tries. Having someone new beat him would be a validation of them being one of the best, and if the match and the wrap up to the match were done right it might not even reflect badly on them. A face could win after a long, hard fought match, and then, while barely able to stand himself he helps the Undertaker to his feet, shakes his hand and they help each other out. A heel could laugh about winning after a series of cheap, dirty tactics, and leave him laid out in the middle of the ring. Even down the road, if that person changed their character to go from heel to face or vice versa, they'd be remembered as the person who actually managed to take down the Undertaker at Wrestlemania. Having Brock, who's only around part time at best, beat him just kinda says to the people who care that the whole thing didn't matter. A part time fighter beating the man no one else could feels like kind of a let down to me at least. Agreed. The truly sad thing is, it overshadows the guy who should be the star of the show, Daniel Bryan. He finally got his big win, he finally got his due... but go to WWE.com and what's the headline? "Streak Broken". It's like CM Punk and his long reign including winning at Mania, but it's overshadowed by Rock vs. Cena... sad, really. I just wish all the dinosaurs, relics, and stars of 2001-2006 would take a powder (Lesnar, Borton, Bootista, Cena, Trips especially) and start building the people fans can root for over the next decade. Then let THEM be the stars of the show, the real stars. 2) Undertaker really wanted to retire...no more Mr once a year, effective immediately. 3) The streak simply can't go to a new blood as a "passing the torch moment" as Ekhari mentioned. Also the expectations will be too much for a relatively unseasoned talent to carry. tl:dr am I the only one who thinks everything that happened makes perfect sense? You are conflating the Authority, the storyline figureheads, with the creative team and the web team and everyone else who makes storylines and websites happen. Also, I categorically disagree with your third point. There's absolutely no reason why the Streak could not be a torch passed to the next generation instead of being wasted on Brock Lesnar and his part-time I-wanna-go-back-to-UFC-maybe career. Properly built up, anyone could be a viable threat to the Streak. Hell, it could have catapulted Zack Ryder back to relevance. Instead, it was wasted on someone who genuinely doesn't need or benefit from the push. 1) Who's the "lucky" kid who will have to wear the crown for the next 20 years? I think they straight up murdered Mania for a lot of people by ending the Streak. My facebook exploded with hate from people I didn't know where wrestling fans over it. I missed the last half do to travel and work. If you wanted to end the streak do it on another night and another person. Brock Lesnar is the wrong guy, he has been damaged goods since he came back. Bryan deserved the night for himself. I also don't think HHH did him any favors either in the first match with it going on forever and doing his best Benoit memorial. Cena had to go over. Cena is not turning heel to some fat sweaty midcarder. I thought that was the match of the night. 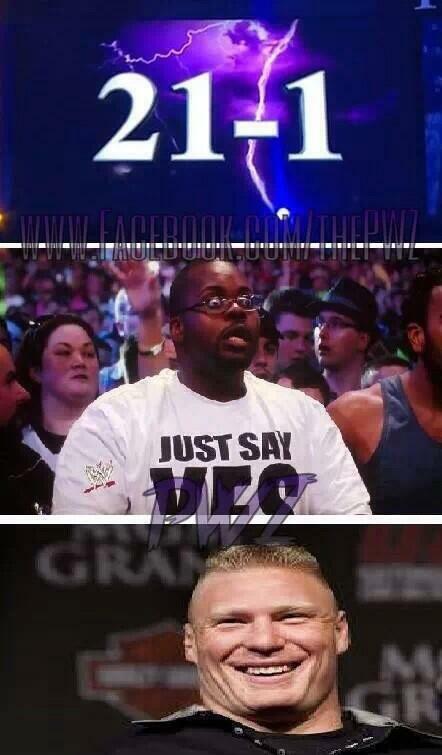 Taker chose to lose to Lesnar. That's why it happened. It says something about Taker's respect for Lesnar. "Why not a young guy?" Well, lets look at that. Some young guy beats him, a year later thinks he isn't getting pushed, takes his ball and goes home. Sweet, you wasted that crazy moment. Give it to a main event player, an established guy, someone who is made off of other things and this is a giant caper. Flair fell to Michaels, not some young guy. Michaels fell to Taker, not some young guy. Taker fell to Lesnar, doesn't mean he is done yet. A 6 year long story came to a close last night. Taker let himself look more human and mortal than he has ever been before. He got in little to no offense outside of some punches. He let Brock, more or less, man handle him. Lesnar will be your world champion going into Wrestlemania next year, either that, or Brock will be coming for that title at Mania. The road is about to get mighty bumpy for Daniel Bryan. The Beast Incarnate might just swallow him alive. Isn't Orton in the prime of his career? Cena is on the backside, but barely. Batista and Triple H are certainly way past their prime, but it seems like people are making Orton "guilty by association" since he started so young. The torches can't all be passed at once, it needs to be a mix of veteran, prime, and young talent for effective story telling and to keep the interest of multiple generations of fans. Okay, I'll give you that on Orton, but he's guilty by association because he's been feuding with Cena and Batista, and those were done to DEATH in the last decade (moreso the first). At least Orton / DBry puts a new spin on it, but once that's done, it's back to the others. If they would bring more guys UP rather than bringing than BACK, Orton could have new feuds, which wouldn't make him seem so been-there done-that. Also, he hasn't really changed in a few years. He smiles a little as a face, he sneers a little as a heel, but he's very much the same guy either way, lol. Also, I think it's not quite an indication of 'overshadowing' that WWE.com is all 'The Streak is Over!' and not about Bryan - They're still trying to sell 'Find out what happened at the Mania Main Event', so they're being coy on the landing page. A 6 year story? Please elaborate because to me the worst part of all of this is the lack of story that was told. They never addressed the fact that Taker challenged Brock or why Taker would do that. Did Taker ever beat Brock on PPV or at all? They never used the "UFC Encounter" footage from a few years back. Bless Heyman's Heart, he tried with his promos, but it seemed like they didn't really bother to build on the history of these wrestlers. That's a good point. Brock has a legitimate claim to challenge for the title now. Of course, I think Cesaro does too. I hope the hype behind the "Coveted" trophy we made up a month ago comes with some payoff. In any case, hopefully, we'll see D-Bry with some fresh match-ups soon and a win over Lesnar would really help cement Bryan as an A-Plus player. Either Dean Ambrose or Bray Wyatt could have run with that particular ball. Not for 20 years, but a few, at least. What they had Wyatt do at Wrestlemania was good. Not great, but good. He looked like a champ against Cena, and they did kind of tell an interesting story. However, Wyatt's the creepiest thing in wrestling right now, not counting Vince's various obvious obsessions, and having him usurp the Undertaker's position as the 'E's malevolent force would have done wonders for his character in ways that mildly annoying John Cena simply won't. Ambrose, meanwhile, could have been split off from the Shield a couple months ago, in time to pull this off. (Simple method: jealousy over Roman Reigns being the seeming breakout star, despite Ambrose being the only champion in the group, with Rollins siding with Reigns due to him not being a jackbag about it all.) Ambrose's angle could have been simple: "Okay, Undertaker. You're a legend, we get that. You've been winning Wrestlemania matches since I was 5, you've held a jillion titles, you've beaten Hall of Famers by the bucketful... you're one of the great stars of the previous generation. Key word there is previous. You beat legends, old timers, old men... hell, you haven't even faced anyone under the age of thirty at Wrestlemania since 2005! If all you're good for these days is a twenty minute slog against someone born in the Carter administration, then you shouldn't be taking up space on the card. The problem with you, Mark, is that you haven't had to prove yourself against anyone for a decade, because you've been sheltered from anyone hungry enough to take you to your limit. Well, I'm here, and I'm starving. It's time for a new legend to start, and that legend will be me. And can you do anything about it? Nope."